A Boeing 737-236 passenger plane, operated by Bhoja Airlines, was destroyed in an accident near Islamabad, Pakistan. All 121 passengers and six crew members were killed. Bhoja Airlines flight 213 departed Karachi (KHI) at 17:05 on a domestic flight to Islamabad (ISB). This was the inaugural evening flight for the airline on this route. The flight climbed to a cruising altitude of FL310 and continued towards Islamabad. Weather at the destination was poor due to a passing thunderstorm. At 18:19 the captain at a distance observed the squall line. Moments later the flight was cleared to descend to FL200. During the descent the captain and first officer discussed the weather. They were worried about the severity of the thunderstorm ahead. At 18:26 the first officer contacted Islamabad Approach and received clearance for the One Foxtrot arrival for an ILS approach to runway 30. After receiving further descent clearance the first officer discussed opportunities to approach the airfield through a gap in the squall line. The Approach controller gave radar vectors and descent instructions to fly through the gap in the storm. At 18:35, Islamabad Approach gave a weather update and said "Bhoja 213 surface wind at Islamabad ah is varying between 180° to 270°, 10 kts and ah sometimes gusting to 20 kts and runway condition is wet, light drizzle is ah uhm going on, braking action not known". Two minutes later the airplane entered the squall line. Although the Bhoja Air Operational Manual prohibited flight in these conditions, the captain decided to continue. The airplane was configured for the approach with flaps and slats selected and the undercarriage was down. The first officer then reported the speed to be 220 knots, which was 30 knots higher than the recommended speed. The captain reacted surprised as he did not expect this because the he was flying with the auto-throttle engaged. Likely the increase in speed was a result of windshear. The aircraft then entered the active weather cell with precipitation continuing in varying intensity. At 18:39 the airplane captured the ILS and descended on the glide slope. At this point the aircraft should have been in landing configuration with flaps at 30°. However, only flaps 5 were selected. The aircraft then encountered an increasing downdraft. The pitch attitude increased and computed airspeed decreased as the autopilot attempted to maintain the glide slope. The GPWS consequently sounded with the aural alarm: "Wind shear - Wind shear - Wind shear". Although the first officer anxiously called for a go around, no action was taken. The downdraft dissipated and the pitch attitude decreased but the aircraft deviated left of the extended runway centerline, and was brought back by the captain. At that moment the autopilot disconnected due to the aircraft deviation beyond the autopilot maximum authority limits. The auto throttle remained engaged in IAS speed mode. Following autopilot disconnect, there was no control wheel activity recorded for approximately 6 seconds and no control column activity for approximately 8 seconds. The crew were likely confused. During this period of control inactivity, the aircraft deviated below the glide slope. Then the Terrain Awareness Warning System (TAWS) alarm sounded: "Whoop, Whoop, Whoop". No action was taken by either crew member. A few seconds later the aircraft entered another downdraft and the rate of descent increased rapidly. The TAWS alarm sounded again, directing the crew to "pull up". The captain responded with a nose-up column input. However, pressure altitude and thrust continued to decrease. The downdraft dissipated rapidly, resulting in a rapid increase in angle of attack of the aircraft, which activated the stick shaker for almost 2 seconds. It appeared that captain lowered the nose down to get out of stick shaker regime however, proper and complete Boeing recommended stall and recovery procedures were not carried out. This resulted in a 12° nose down pitch. Then another windshear alarm sounded, followed by another stick shaker activation. The first officer shouted to "get out" and "go around" but the attempts by the captain failed as he did not apply the proper procedures to execute a go around. Shortly after initial ground contact, the aircraft struck a steeply sloped terrace about 5 meters high which resulted in significant structural breakup of the aircraft structure. The ineffective automated flight deck management in extreme adverse weather conditions by cockpit crew caused the accident. The ineffective automated flight deck management was due to various factors including; incorrect selection of cockpit crew on account of their inadequate flying experience, training and competence level for Boeing 737-236A (advanced version of Boeing 737-200 series), absence of formal simulator training in respect of FO for handling an automated flight deck, non-existence of cockpit crew professional competence / skill level monitoring system at operator level (Bhoja Air). The cockpit crew incorrect decision to continue the flight for destination and non-adherence to Boeing recommended QRH and FCOM remedial actions /procedures due to non-availability of customized aircraft documents (at Bhoja Air) for Boeing 737-236A (advanced version of Boeing 737-200 series) contributed towards the causation of accident. 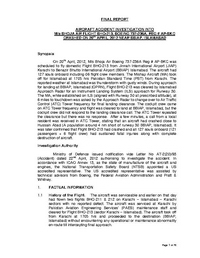 The inability of CAA Pakistan to ensure automated flight deck variance type training and monitoring requirements primarily due to incorrect information provided by the Bhoja Air Management was also a contributory factor in causation of the accident. Distance from Karachi-Jinnah International Airport to Islamabad-Benazir Bhutto International Airport as the crow flies is 1119 km (700 miles).